A method for diagnosing alcohol abuse of an individual is characterized in that the levels of CDT (marker 1) and at least one liver status marker (marker 2) are measured in a body fluid sample whereafter the levels for the markers are weighted to a common value according to a formula giving a better sensitivity and/or specificity than obtained for either or both of the markers, said value then being correlated to alcohol abuse. The invention concerns a diagnostic method utilizing carbohydrate deficient transferrins (CDT) as markers for alcohol abuse. The term CDT thus encompasses any isotransferrin that occurs in elevated levels upon alcohol abuse. Alcohol abuse also encompasses alcohol over- consumption. During the late seventies it was observed from isoelectrophoretic experiments that body fluid levels of disialotransferrin were elevated as a consequence of alcohol abuse (Stibler et al . , Clin. Chem. 37/12 (1991) 2029-2037). This observation has lead to two commercial products - one from Pharmacia & Upjohn AB, Diagnostics (Uppsala, Sweden) and one from Axis A/S (Oslo, Norway) . Both products relate the sum of disialo-, monosialo- and asialotransferrin levels to alcohol consumption. From the very beginning only disialotransferrin was observed as a marker. Later it was found that also the asialoform was a marker. So far no clear correlation between elevated levels of the monosialoform and alcohol abuse has been found. Quite recently it has been suggested that also trisialoform levels correlate to alcohol abuse (Heggli et al., Alcohol & Alcoholism 31(4) (1996) 381-384), although the present applicant has failed to confirm this. There is a number of non-CDT markers that have or will be used in connection with the diagnoses of alcohol abuse/alcohol overconsumption. Variations in body fluid levels of most non-CDT markers are independent of variations in CDT-levels. Some of them are general liver status markers, such as serum γ-glutamyl transferase (GGT, γ-GT) , serum aspartate (ASAT) , and serum alanine aminotransferases (ALAT) . Others are haematological indexes, such as whole blood erythrocyte mean corpuscular volume (MCV) and red cell distribution width (RCDW) ; lipid metabolism markers, such as total high density cholesterol (HDL-chol) and its subfractions (HDI_2 and HDL3 ) , triglycerides, total cholesterol, apolipoprotein A (apo A) and its subfractions (Aι# An) ' apolipoprotein B (apo B) ; iron metabolism markers, such as ferritin; protein-acetaldehyde adducts, such as hemoglobin and albumin acetaldehyde adducts. Further there are β-hexosamidase, dolichols, methanol, 5- hydroxytryptophol (5-HTOL) , alkaline phosphatase (AFOS) and its isoenzymes. Most of the non-CDT markers used in the context of the diagnoses of alcohol abuse have suffered from poor specificity (overwhelming number of false positives) . Although the specificity and sensitivity of CDT for diagnosing alcohol abuse have been considered good, there has been an expressed desire for improvements. The diagnostic values of discriminant score and combination of laboratory tests for general liver status markers have recently been suggested for increasing sensitivity and specificity in the diagnosis of alcohol abuse (Sillanaukee P., Arch. Pathol . Lab. Med. 116 (1992) 924-929; and Cushman et al . , Alcoholism: Clin. Exp. Res. 8 (1984) 253-257). However, the found increase in sensitivity and specificity did not place them on the same level as CDT alone. Levels of CDT, MCV, ALAT and ASAT have been measured and the diagnostic specificity and sensitivity compared between the markers (Sillanaukee P. et al . , Alcohol. Clin. Exp. Res. 17 (1993) 230-233; Lδf K et al . , Alcoholism: Clinical and Experimental research 18/4 (1994) 889-894) . The main objective of the invention is to improve the specificity and sensitivity of CDT as a marker for alcohol abuse. By specificity is meant 1 minus percentage of false positives. By sensitivity is meant percentage of true positives . Another objective is to improve the diagnostic results for those individuals that are positive/negative or negative/ positive. The invention is based on the discovery that CDT body fluid levels when appropriately combined with body fluid levels of the above mentioned non-CDT markers may result in an improved sensitivity and/or specificity. The objective is accomplished by using a method that is characterized in that the levels of CDT (marker 1) and at least one non-CDT marker for alcohol abuse (marker 2) are measured in a body fluid from a human individual, whereafter the levels measured for the markers are weighted to a common value according to a formula giving a better sensitivity and/or specificity than obtained for either or both of the' markers. A common value that is larger than common values for healthy individuals not abusing alcohol is then taken as an indication that the individual suffers from alcohol abuse . Levels of CDT may be expressed either as absolute amounts or as relative amounts (e.g. %CDT in relation to total amount of transferrin) . Non-CDT markers may also be expressed as absolute or relative amounts. The most preferred non-CDT markers (marker 2) are those that are described in the experimental part, but also 5- HTOL, various adducts between acetaldehyde and proteins and antibodies directed against acetaldehyde adducts of native proteins and specified part sequences thereof are included. Among acetaldehyde adducts those with albumin and hemoglobin are important. Among antibodies those of the IgA class are likely to be the most pertinent to measure. * a and b are coefficients . * clog indicates that any log may be used, but that 3-ulog and elog (In) are preferred. In case further markers are measured and included in the common value each additional marker, m, is weighted and c added to the value y as a log (marker m) where a is a coefficient for marker m and (m) is the level of marker m. The levels of CDT and marker 2 may be given as an absolute concentration (μg/1, μM, units per litre (U/L) etc) or relative concentrations/amounts. Relative amounts/concentrations often refer the ratio between the absolute amount/concentration of CDT or marker 2 to the total amount/concentration of the corresponding entity in the sample or of some other component in the sample, such as amount of water. The coefficients a and b vary for different marker and marker combinations as well as with the dimension of the level of the marker. For CDT (disialo-, monosialo- plus disialotransferrin) and GGT, for instance, the ratio a:b is normally between 1-2.5 in case CDT is given in mg/ml and GGT in U/L, with the preferred values being within 1.5- 2.0. The same values also apply for disialotransferrin alone and for relative amounts of CDT (amount di- + mono- + asialotransferrin to total amount of transferrin) (in combination with GGT) . The experimental part shows how to determine the formula for CDT and GGT. Figure la and b: Summary parametric ROC plots. Figure 2a and b: Summary non-parametric ROC plots. Figure 3 : Patients groups . EXPERIMENTAL PART 1. MATERIAL Several data sets from Medical and Regulatory Affairs of Pharmacia & Upjohn Diagnostics were available for analysis. The analysis strategy selected was to use two of the data sets for calibration, i.e. to use them to find functions of the data that could discriminate between "alcohol abusers" and "normals" . Three other data sets were used as test data sets to confirm the findings from the calibration data sets. A sixth data set, the "Hiroshi" data, was later added to the test data sets, since it also contains NALD and ALD patients (non-alcoholic liver disease and alcoholic liver disease, respectively) . The data sets had somewhat different structures, but in general it was possible to define a "normal" group and at least one "abuser" group in each data set. The subject groups in the two calibration data sets are reported in Table 2. ^ Inclusion criteria for groups RI and R2 were that patients should have normal values of GGT. The subjects could be classified into groups according to Table 4. It should be pointed out, however, that not all data sets permitted the detailed classification given in Table4. Table 4: Subject groups used in the study. See Figure 3. A sixth data set, the "Hiroshi" data set, was added later. The structure is given in table 5. Not included; classified as pseudo-heavy drinkers. The subjects in the different studies were classified into the groups presented in Table 4 according to the following table : Table 6: Summary of classification into subject group for all data sets; group symbols as explained in Tables 2 - 5. Linear determinant analyses (see e.g. Johnsson and Wichern, Applied multivariate statistical analysis, 3rd edition. Englewood Cliffs: Prentice Hall (1992)) was used to find linear combinations of predictors that could differentiate between "alcohol abusers" and "normals". Variables were tested both in untransformed and logtransformed forms. The DISCRIM and STREPDISC procedures of the SAS (SAS Institute Ine (1990) : SAS version 6, first edition, Cary, N.C.) package were used for the analyses. For comparison between different classification criteria, ROC plots (see e.g. Zweig and Campbell Clin. Chem. 39/4 (1993) 561-577. were prepared. Two types of ROC plots were used: parametric ROC plots that rest on the assumption that variables are normally distributed, and non-parametric ROC plots that avoid the normality assumption. Both types of ROC plots were prepared through a program written using the SAS (1989) language and SAS/Graph plots. The area under the curve in each ROC plot was calculated for each criterion. • All variables except TOTTRANS and MCV should be used in their logarithmic form. • LogCdt and LogGgt taken together are the best predictor variables for differentiating between alcoholics and normals . Calculate Y =0 .8xLogGgt+l .35xLogCdt for each individual . Discriminant function coefficients. The coefficients in discriminant functions for all data sets are given in Table 8. These results are presented in order to validate the results obtained in the calibration data sets. Discriminant function coefficients when all data sets were merged were 1.55 and 0.72 for males; and 1.43 and 1.32 for females. The coefficients suggested in section 3.1 for calculating Y=l .35 -Log (CDT) +0.80 -Log (GGT) was based on the calibration data sets, 92TD02 and 92TD04. As has been noted in other studies, cutoff limits for CDT and GGT are different for males and for females. The cutoff limits for Y could be taken to be the same for both sexes . The provisional limit of 6.5 was based on the test data sets (92TD02 and 92TD04) . Based on the results from all data sets, the limit might be set at 6.4 instead. The Table 10 summarizes the empirical sensitivity and specificity for the different data sets. The largest value in each triplet (i.e. for each variable) has been underlined. Cutoff limits used were 6.5 for Y, 3.1 for LogCdt (corresponding to Cdt=22) and 3.1 for LogGgt, corresponding to Cdt=22. Table 10: Empirical sensitivity and specificity for all data sets. Cutoff limits are Y=6.5; CDT=22; and GGT=22. (LogGGT=3.40) It was suggested above that the cutoff for Y might be selected as 6.40. The empirical sensitivity and specificity for the different data sets when using these alternative cutoff limits are presented in Table 11. Y has the highest sensitivity in all data sets, both for males and for females (Table 11) . Table 11: Empirical sensitivity and specificity for all data sets. Cutoff limits are Y=6.4; CDT=20 for males, 26 for females; and GGT=40 for males, 30 for females. The total number of misclassifications according to the different variables, using different cutoff limits, are presented in Table 12. The data consist of all subjects in all data sets; however, data set Hiroshi was excluded for females since it did not contain any alcohol abusers. For males, the total error rate is considerably smaller when using the variable Y (Table 12) . The smallest error rate is obtained with the cutoff limit Y=6.5. Even for females the total error rate is smallest when using the variable Y with cutoff limit 6.5, but here the difference compared to using LogGgt for classification are small. Table 12: Number of false positives and false negatives for all data sets together, for different variables and cutoff limits . It appears that LogGgt is more likely to classify NALD patients as alcohol abusers . 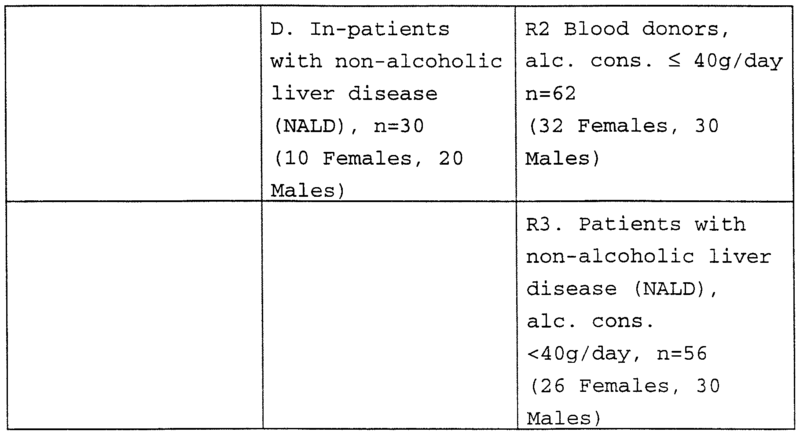 LogCdt has the lowest probability of classifying NALD patients as alcohol abusers, while the weighted variable Y is intermediate. Parametric ROC plots for each of the six data sets and a summary parametric ROC plot that includes all Normal and Ale groups were done. Only the summary plot is given (Figure 1) . For each plot the area and for each of the variables Y, LogCdt and LogGgt the area under the curve was calculated. See table 14. The largest area for each data set is given in bold (Table 14) . The area under the ROC plot was largest for the variable Y in all individual data sets, and for the joint analysis of all data sets taken together. Table 14: Area under parametric ROC plots for different variables; Males and Females. The largest value for each data set has been bolded. Non-parametric ROC plots for each of the data sets and a summary parametric ROC plot were done. Only the summary parametric ROC plot is shown (Figure 2a and 2b) . For each plot and for each of the variables Y, LogCdt and LogGgt, the area under the curve was calculated. Table 15 gives the result. The largest area for each data set has been given in bold. Table 15: Area under non-parametric ROC plots for different variables; Males and Females. The largest area for each data set has been bolded. ROC plots. The area under the ROC plot is largest for Y, for both sexes, in the joint analysis of all data sets together. For males, Y has the largest area in all individual data sets. For females, Y is best in all data sets except 90TD06 and 92TD01, where LogGgt is slightly better. Parametric ROC plots comparing the groups ALD vs NALD; Ale and ALD; and Norm and NALD, were prepared for two data sets that contained these groups. The plots are not included. The area under the curves was calculated as for tables 14 and 15. The results are given in table 16. The largest area for each curve and variable data set has been given in bold (Table 16) . The area under the ROC plot is largest for the variable Y in males of both individual data sets and in females of another data set. Table 16: Area under parametric ROC plots for different variables; Males and Females. The largest area for each data set has been bolded. • For males, the area under parametric ROC plots is largest for Y, for all data sets. • For males, the area under nonparametric ROC plots is largest for Y, for all data sets. • For females, the area under parametric ROC plots is largest for Y for all data sets. • For females, the area under nonparametric ROC plots is largest for Y for all data sets except 90TD06 and 92TD01. For those data sets, LogGgt is slightly better. Similar analyses also showed that linear relationships giving improved sensitivity and/or specificity for alcohol abuse compared to CDT alone also could be achieved with combinations of CDT with ALAT, ASAT and MCV, respectively. 1. 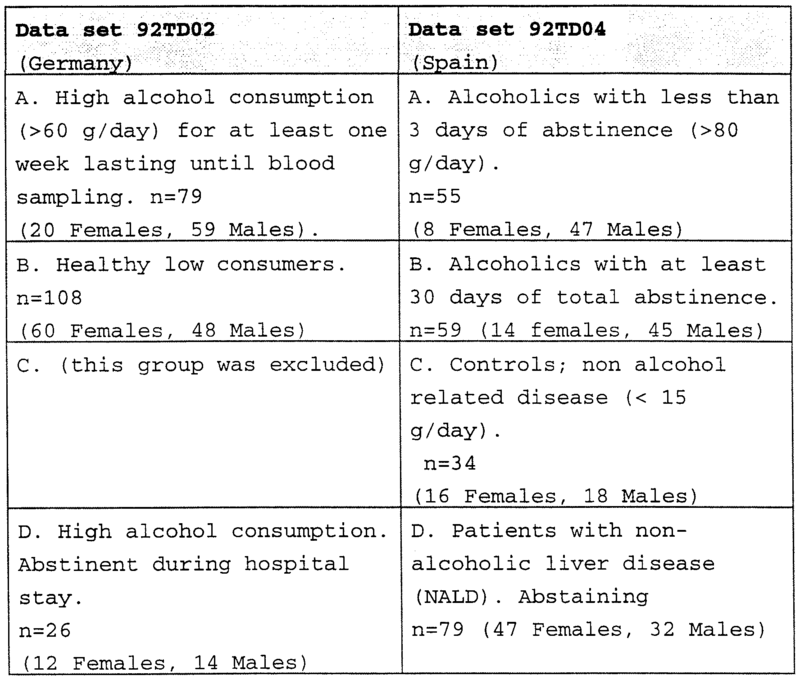 A method for diagnosing alcohol abuse of an individual characterized in that the levels of CDT (marker 1) and at least one liver status marker (marker 2) are measured in a body fluid sample wherafter the levels for the markers are weighted to a common value according to a formula giving a better sensitivity and/or specificity than obtained for either or both of the markers, said value then being correlated to alcohol abuse. * clog stands for any log wi.th* preference f -or 10 -log or elog (ln) * a and b are coefficients. 3. The method of claim 1 or 2 , characterized in that CDT is the sum for disialo-, monosialo- and asialotransferrin. 4. The method of any one of claims 1-3, characterized in that marker 2 is ╬│-glutamyltransferase (GGT) . 5. The method of claim 4, characterized in that the ratio of the coefficients a and b is within the interval 1-2.5, with preference for 1.68. McLaughlin et al. 2005 Is there a simple way to identify insulin-resistant individuals at increased risk of cardiovascular disease? Pleban et al. 1982 Determination of selenium concentration and glutathione peroxidase activity in plasma and erythrocytes. Turner et al. 1989 Distribution of sodium-lithium countertransport and blood pressure in Caucasians five to eighty-nine years of age. Bohn et al. 1995 The Alcohol Use Disorders Identification Test (AUDIT): validation of a screening instrument for use in medical settings.